This easy salmon pasta, served in creamy garlic sauce, is ready in the time it takes the pasta to cook. Dinner can be on the table in 10 minutes with this tasty midweek winner. I love recipes that are quick, easy and fuss-free to make, but really deliver loads of flavour. 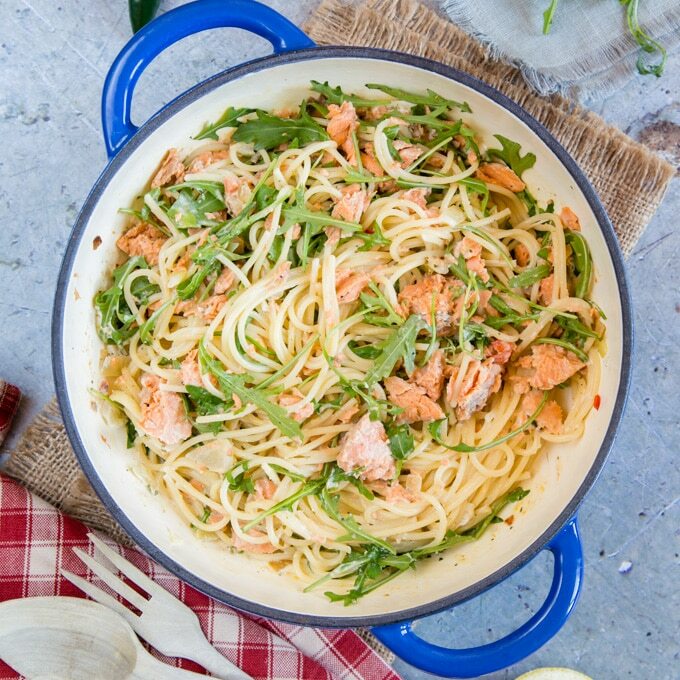 This 10-minute creamy salmon pasta with garlic and rocket hits the spot perfectly. Just because there are times I’m feeling a bit lazy doesn’t mean that I don’t want a tasty meal, so this recipe is perfect for those occasions. Richly flavoured from the Wild Alaska Salmon, and garlic and herb cheese, with a hint of heat from the sliced chilli, it’s the sort of ‘results in a hurry recipe’ that I make often. This store-cupboard recipe uses ‘cheat’ ingredients, including canned salmon, garlic & herb cheese and even diced frozen onion. Perfect for a mid-week supper in front of the television, a few swaps turn it into a dinner-party dish that is ready just as quickly. Step one – Measure out the ingredients. ALWAYS, always weigh your pasta. It’s very easy to cook far too much, especially when using dried pasta. Bring a large saucepan of salted water to the boil, and start cooking the pasta according to packet instructions. Step two – Melt the butter in a frying pan or skillet and cook the onion until it starts to turn golden. Step three – Add the sliced chilli. Step four – Add the garlic & herb soft cheese. Step five – Skim off 2 tablespoons of pasta water and add it to the frying pan along with the zest and a squeeze of lemon juice. 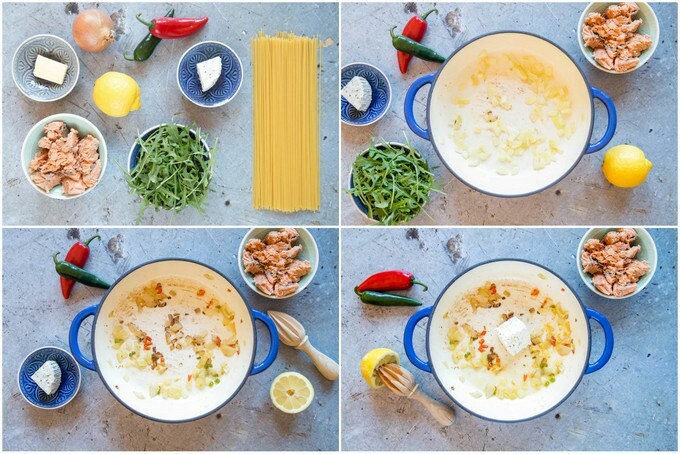 Step six – Melt the cheese mixture over a low heat until you have a creamy sauce. Add a little more pasta water if needed. Step seven – Flake the salmon into chunks with a fork. 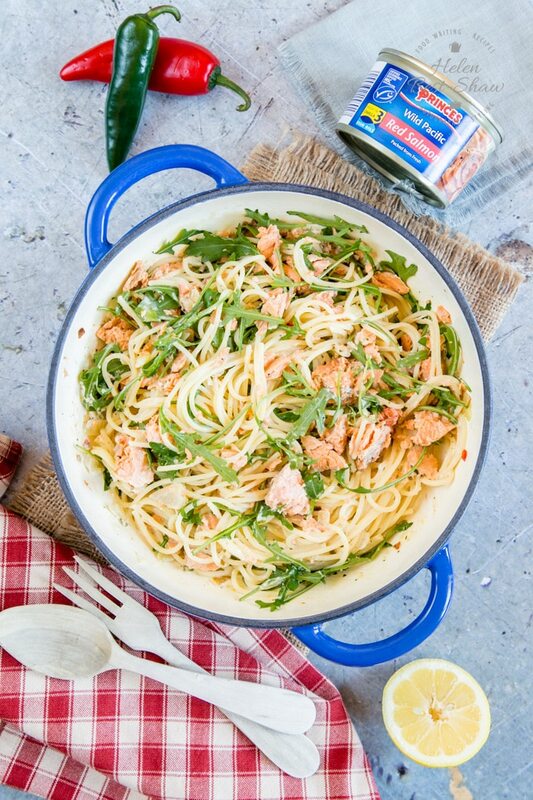 Drain the pasta and add it to the sauce along with the salmon and rocket. Season generously with black pepper. Step eight – Stir gently together to mix and serve immediately. When making pasta sauce, always add a little of the pasta water to the sauce and stir it in. This gives a silky smooth sauce that evenly coats the pasta, really lifting the dish. Make a dinner party version of this dish by using premium-quality fresh pasta and adding a glug of white wine in place of the lemon juice. When a recipe uses half an onion, chop the whole onion and freeze the spare in an airtight box to cook from frozen next time. Leftover chillis can also be used in the same way. Leave the chilli out if you don’t want the heat. 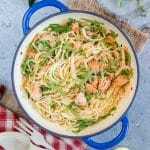 The quantities are very forgiving and the recipe is very generous with the amount of salmon, so you could easily add extra pasta to serve 3 or even 4. Add a spoonful of water when reheating leftovers in the microwave. Add some extra veg to this creamy salmon pasta to make it even healthier – we have lots of ideas on how to add extra vegetables to pasta dishes. Use different flavours of cream cheese. A handful of coriander/cilantro would be delicious with the salmon. I made this dish with gloriously coloured Pacific red salmon from Princes; wild salmon, caught and processed in Alaska. The Alaska fishery is the world’s largest red-salmon fishery; careful control by the authorities of the amount fished each year means that it’s sustainable, so I don’t have qualms when opening a tin. Alaska, with it’s clean, pristine environment is perfect for fishing. The state’s 34,000 miles of coastline, 3,000 rivers and 3 million lakes are a great source of all sorts of fish and seafood, including five different varieties of salmon. Red salmon, also called sockeye, is the most abundant, and therefore a responsible choice. During the commercial fishing season, the catch is monitored daily to make sure that no species is being overfished, and the long heritage of fishing in the area means that there is respect for the surroundings and the fish. Because of this, when using canned salmon, I know that the quality is sealed into the tin. It is an accessible and economical product, compared to fresh wild salmon. There’s also the added advantage of the long shelf life of tinned products, so it is ideal to stock up on for use in this type of easy meal. 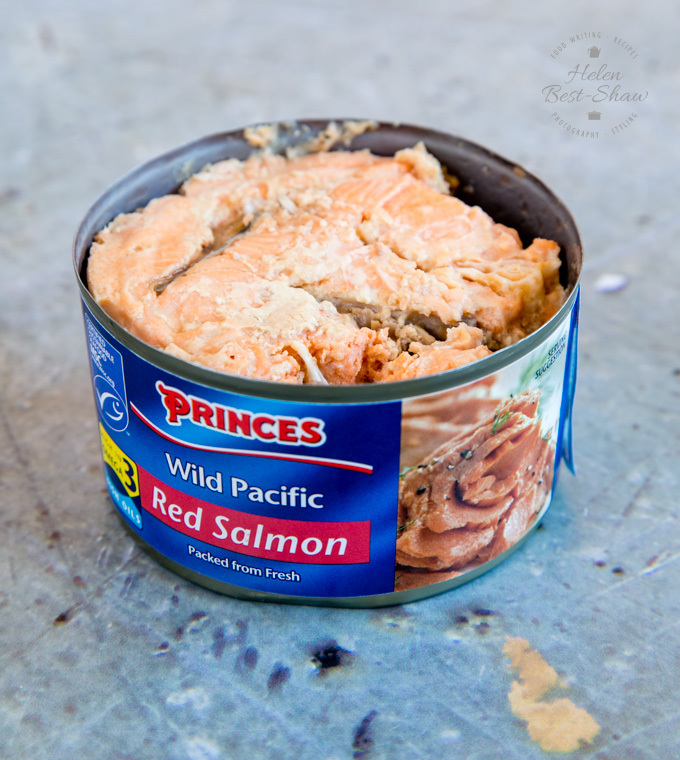 Get your Princes Wild Pacific Red Canned Salmon from Sainsbury’s stores for £3.00 rather than the usual price of £3.50 from 10-30 April 2019. Mix with some Greek yogurt or mayonnaise to make a quick fish pate, or baked potato topping. Fold through rice with hard-boiled egg and chopped chives or spring onions for cheat’s kedgeree. Flake into tomato or marinara sauce with some capers to make a quick pasta sauce. Add breadcrumbs and egg to make a salmon burger. Make a salmon sushi bowl. Wrap in ready-made puff pastry to make salmon en croute. Add to a basic quiche with some asparagus. Serve as a classic salmon and cucumber sandwich. Use in a fish pie. For even more recipe ideas and to learn more about wild Alaska salmon, see the Alaska Seafood site. 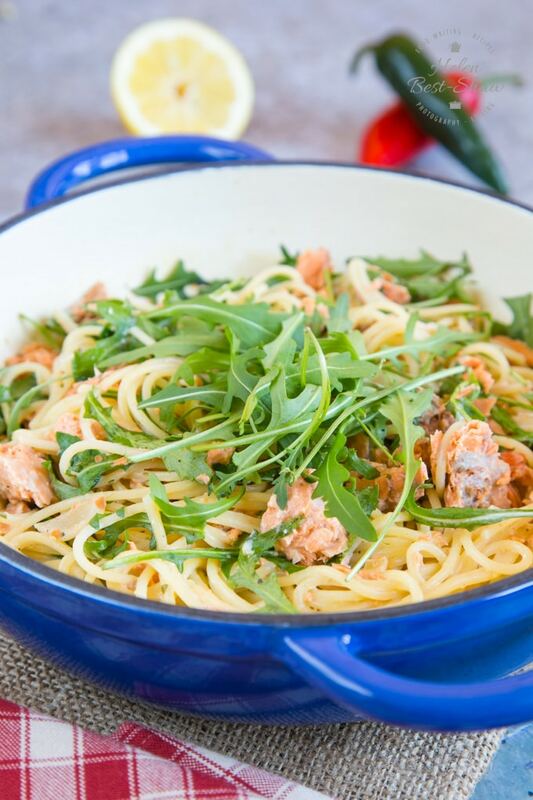 If you try this 10-minute creamy salmon pasta with garlic & rocket please tag #FussFreeFlavours on Instagram or Twitter. It is amazing for me when for me when you make one of my recipes and I really do love to see them. You can also share it on my Facebook page. Please pin this recipe to Pinterest too! Thanks for reading Fuss Free Flavours! This easy salmon pasta, served in a creamy garlic sauce, is ready in the time it takes the pasta to cook. Dinner can be on the table in 10 minutes with this tasty mid-week winner. Boil a large saucepan of water and add salt. Add the pasta and cook according to the packet instructions. Melt the butter in a large frying pan on a medium heat and fry the onion until starting to turn golden. Add the sliced chilli and cook for a couple of minutes. Flake the salmon and add to the sauce along with the chopped rocket. Drain the pasta and add it to the sauce. Stir gently together, season well and serve immediately. When any recipe uses half an onion, chop and freeze the spare in an airtight box to cook from frozen next time. Leftover chillis can also be used in the same way. You can leave the chilli out if you don't want the heat. The quantities are very forgiving and the recipe is very generous with the amount of salmon. You could easily add extra pasta to serve 3 or even 4. Add a spoon of water, and reheat leftovers in the microwave. 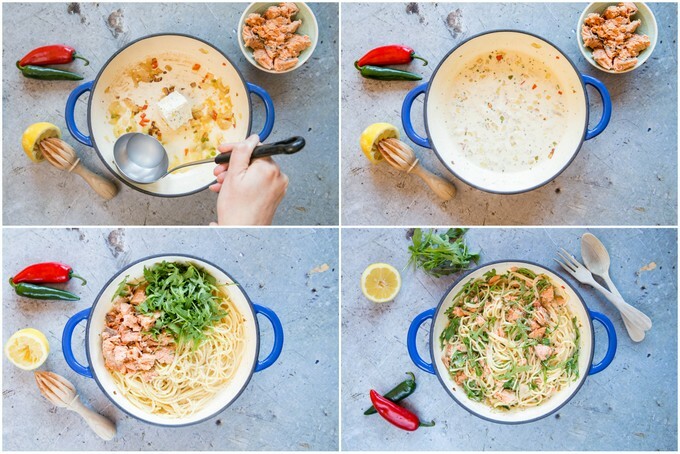 Add some extra veg to this creamy salmon pasta - we have lots of ideas on how to add extra vegetables to pasta dishes.